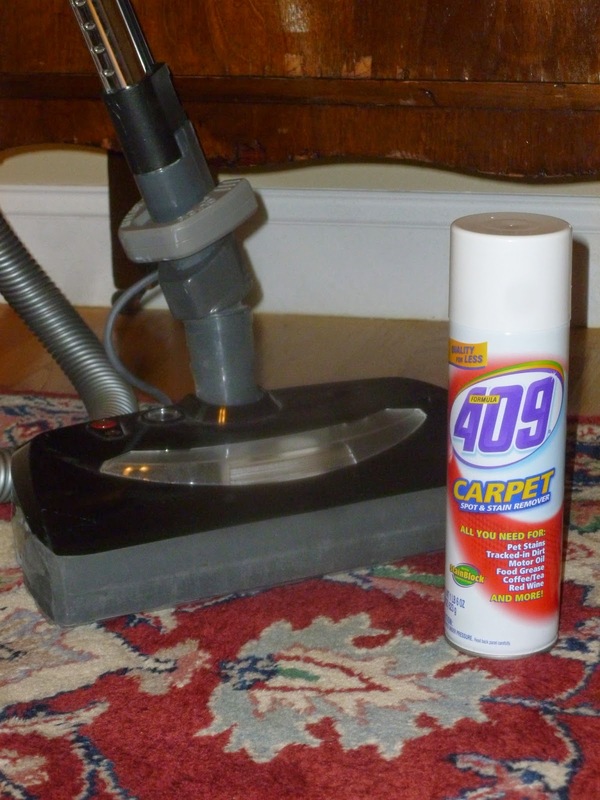 My new obsession is 409 Carpet Spot and Stain Remover. Until now, I’ve been lucky if I got around to vacuuming my rugs, never mind cleaning the spots. In fact, other than my sister coming with her carpet shampooer when I was pregnant five years ago and in “high nesting mode,” I’ve never cleaned my rugs at all in the seven years we’ve lived here. Truthfully, I haven’t cared one bit. But last week we were expecting overnight guests. It’s always when I’m having company that I see things in a new light. Suddenly the stains in the guest bedroom carpet were glaring. So I dug under my kitchen sink and came up with 409 Carpet Spot and Stain Remover that I have no recollection of ever buying. I didn’t really have time to read the directions, but thought I saw a drawing on the bottle of dabbing the stain with a cloth after spraying it. That seemed like way too much work, and more time than I had. So I took the easy route: I just sprayed the spots, let it be, and then vacuumed later. Holy smokes – it worked! The stains were gone! It was that easy! 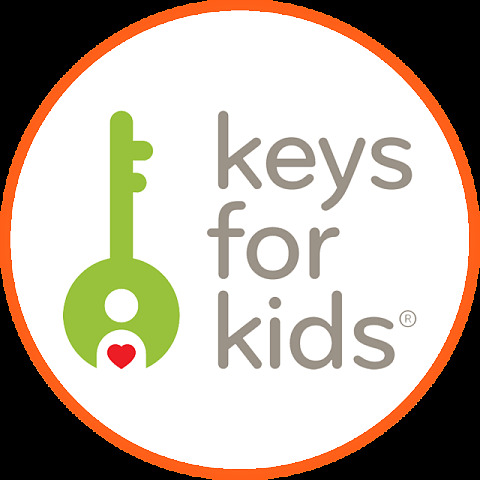 There have been some major struggles with my kids over the years that were like the stains in my carpets: they would start out small, going unnoticed by me because my attention was elsewhere, and suddenly, one day, they became so glaring, I was pulling my hair out. Zack never like to read aloud, But in third grade he flat out refused to do the teacher assigned reading aloud for twenty minutes each night. Consequently, he fell an entire grade level behind in reading. Mason has always been sweet, but he’s also always been VERY slow. It hit the “glaring” phase in second grade when he was taking more than twenty minutes each morning just to change his clothes. That doesn’t sound like that big of a deal, but there’s only so much time before school. Consequently, we were almost missing the school bus every morning last year (and in fact, did miss it at least 10 times). Unlike the rug stain situation where I used the correct thing on the very first try, I wasn’t as lucky with my kids’ problems. In Zack’s case, I spent lots of money on books that I thought would interest him, even more money on a NOOK with a microphone so he could practice reading aloud by himself, took him to the library to choose books on his own, etc. In Mason’s case, I raced him myself, did sticker charts with rewards and prizes, you name it. All of my time, effort, and investments solved absolutely nothing. Both kids were still struggling, and all three of us were completely frustrated. The only trick left up my sleeve was to finally turn to God. I had no choice but to hand it all over to Him in prayer, and let it be. On the first parent teacher conference of Zack’s fourth grade year, I was stunned when the teacher said that he was reading at a fifth grade level. It made absolutely NO sense to me. He left third grade at a second grade level. HOW, in just a few short months, did he jump two whole grade levels? Although I was utterly thrilled, I was completely baffled. A few nights later, after the boys were supposed to be asleep, I heard lots of talking. Right before I turned the door knob to tell them to settle down, it became clear to me that Zack was reading aloud to his brother. When I asked Zack if he read to his brother every night, he said yes, and that he had been doing so since the summer. There was no doubt in my mind that he was divinely inspired. I had turned the problem over to God, sprayed it with prayer, let it be, and Zack was prompted to solve the problem himself. Sometimes it can be that easy! Five weeks into this summer, Mason came down first thing in the morning completely dressed for the day. To say I was pleasantly surprised is an understatement! When I asked him where he got the idea from, he answered, “I don’t know.” Again, there was no doubt in my mind that he was divinely inspired. He has come down every morning since, fully dressed, sometimes with his face washed and teeth brushed too! I had turned it all over to God, sprayed it with prayer, let it be, and Mason was prompted to solve the problem himself. Sometimes it can be that easy! When I see a rug stain now, I immediately run for the stain remover. In fact, I’ve gone through a can and a half in just one week! My carpets have never looked so good. As quickly as I reach for that spray can, I need to reach for God with all the other problems that come my way. I know God helps those who help themselves, and I can be resourceful. But God is The Source. When things are beyond me, they are never beyond Him. I need to trust Him with all my heart. I need to lean on His understanding, not on my own. It may take time, more time that I’m willing to wait, but for the problem to be solved correctly, it has to be solved on His time frame, not mine. So, here’s to turning those unsolvable problems over to God, spraying them with prayer, patiently waiting, and having them seemingly solve themselves. Sometimes it can be that easy! Have you had any situations that seemed unsolvable, only to turn them over to God, and, like magic, they were solved? I’d love to hear about them. This post is such an inspiration Claire. It is not always easy for the control freak in me to lean on others and the stubborn side of me always wants to try to solve it myself. This is a great reminder to lean on God and turn it over to him when we are struggling through an issue. I have an issue with Z right now that I am going to turn over. Thanks for this wonderful post, Claire! There are too many situations to count where I asked God to solve my problems, and He always has. I can’t think of a single situation when my prayers were not favorably answered. Not always as fast as I hoped for, but as you said, “For the problem to be solved correctly, it has to be solved on His time frame, not mine.” He solved my problems and rescued me from an unhealthy marriage, saved me from a horrible boss with a better job instead, solved my financial worries with a raise at work (several raises! ), and has miraculously answered my prayers to heal back pain and other health issues, just to name a few! I love that you added God helps those who help themselves. Having faith in Him to take care of us is not an excuse to be lazy and fail to work for what we want. And thanks for the tip about 409 carpet cleaner, too! I can’t wait to try that. It’s wonderful to hear that God has answered so many of your prayers, Deborah! You inspire me to turn to Him more consistently, trusting that He is always there, and is always listening.